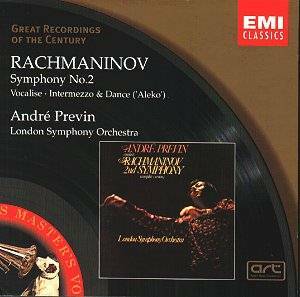 This was a hallmark recording in 1973 in that the symphony was played in its complete version without the disfiguring cuts that even Rachmaninov had sanctioned (although according to Previn he only really approved a small cut in the finale - in a previous LSO recording for RCA LSO Previn had made all the usual cuts). It makes for a long work (nearly an hour) and that has been said to be too long for a composer of such limited ability. Well I think I can answer that simply by pointing to Schubert's 9th symphony or Elgar's second without having to invoke Mahler or Bruckner. What matter is not the length but the invention. The reference to limited ability is that Rachmaninov appeared to constantly worked mine the same vein without ever developing and it was surely the Previn series of Rachmaninov recordings that helped to dispel that belief too, followed eventually by a re-evaluation in the more louring Ashkenazy series for Decca which reached a peak with his performance of the Isle of the Dead. Rachmaninov writes a good tune and all praise to him. He also writes orgasmically for soaring and cascading strings and it might be the association with Mantovani that causes critics to sneer. A composer of good tunes who is 'Popular' will never do and those Paganini Variations!. Well, of course, I am playing the Devil's advocate because I love Rachmaninov. He is not only the ultimate romantic composer but can also be extraordinarily powerful (Isle of the Dead or the Symphonic Dances). To me his appeal is limitless rather than limited and I look back with nostalgia at this recording. It is well known that Rachmaninov's first symphony was a disaster at its first performance and instituted a creative block in the composer that lasted several years until his confidence was restored by the success of his second Piano concerto. The second symphony was completed in 1907; 12 years after the first and found the appreciation he craved. The symphony has appeared in different formats on CD. Its initial CD release was a Japanese-Toshiba pressing and was greeted with horror by Ivan March who complained that the warm opulence of the strings had become dehydrated and even shrill, quite unlike the original LP sound. I was particularly interested to hear this re-mastered CD in the Great recordings of the Century series because I posses that original Japanese CD pressing. I undertook a comparative listening session with interesting results. In spite of laudatory comments in the past I suspect that this never was a particularly good recording and EMI's engineers have had to struggle with it ever since. The sound is hard as if the microphones were placed too close, particularly to the strings. The new CD is cut at a higher level than the Japanese pressing which constitutes a problem when trying to switch between the two for comparative purposes. There is tape hiss and this has become more obvious in the remastering in spite of "Abbey Road Technology". The bass is firm and the string sound is definitely warmer in the original in spite of Ivan March bemoaning a loss of warmth. What would he think of the remastered version where the basses are drier and the strings have acquired a buzzy edge? But all is not in favour of the Japanese pressing because the louder passages are definitely less congested in the remastered version, probably to do with sucking out the bass. So not a total success and I suspect we will have to wait for one of the audiophile companies to obtain the rights to this tape to hear it reveal its true qualities. Nevertheless the performance is overpoweringly convincing and worth every penny of the mid-price demanded. A further advantage of the reissue is that the symphony is now joined by Vocalise and the Intermezzo and Women's Dance from Aleko making a very full disc. Equipment used: Audiolab 8000CDM CD transport, Meridian 518DAC, Chord DSC900 converter, Chord SPM1200B amplifier, B&W 802 speakers with appropriate interconnects.